The Crag Station is running a schedule of 4 monthly lectures through the 2012 /13 winter. The aim of these is to bring folk together each month to see some fantastic climbing images and hear some epic stories, while catching up with friends over a drink. The venue is the Boarshurst Band Club in Greenfield. Doors & bar open at 7pm, lectures start at 7.30pm. Tickets are £8. 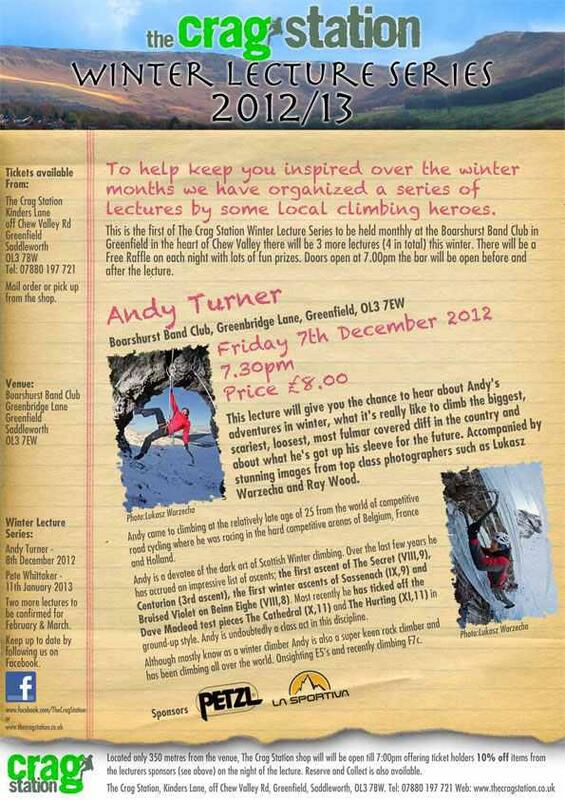 The next lecture is on Friday 7th December 2012 – Andy Turner: his move into climbing from pro-cycling, modern mixed and winter climbing and the Long Hope Route.